The high quality HD ED optical system of Alpen's new Rainier binoculars #75 and #77 maximizes light transmission to bring every last ray of light to your eyes even in the worst flat-light, dawn or dusk conditions. HD (High-definition) ED (Extra-low Dispersion Glass) delivers the best premium-performance at a level of clarity never before achieved. All Rainier binoculars push the limits of optical perfection. All optical components receive our exclusive UBX™ multi-layer coating for maximum light transmission. The extra large BAK-4 prisms are coated with over 60 layers of Alpen's SHR™ metallic and PXA™ phase coatings to deliver the best brightness, clarity and color fidelity. Large diameter lens elements throughout the optical system provide enhanced field of view and eye relief for easy viewing. 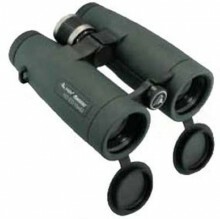 Rainier binoculars are extremely rugged, yet precise optical instruments providing years of reliable performance. Click the button below to add the Alpen 8x42 Rainier HD ED Binoculars to your wish list.